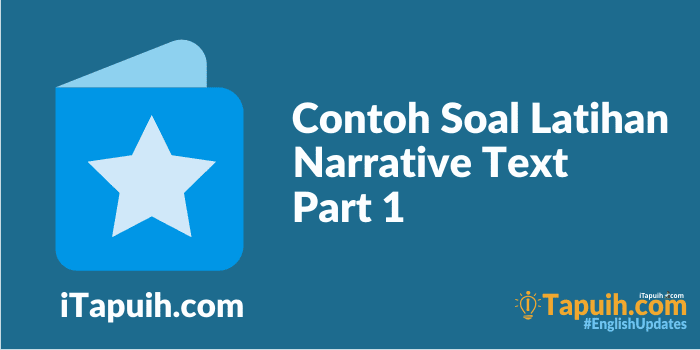 iTapuih.com - Contoh Soal Latihan Narrative Text (Part I). Kali ini Paja Tapuih akan share tentang Kumpulan Contoh Soal Latihan Narrative Text (Part I) lengkap beserta kunci jawabannya. Jika anda masih bingung tentang "Narrative Text" silahkan baca postingan saya sebelumnya tentang Penjelasan dan Contoh Narrative Text Terlengkap. Text for questions number 1 to 6! Once there was a farmer in Laos. Every morning and afternoon he plowed his field with the help of his buffalo. One day a tiger saw the farmer and his buffalo working. The tiger was surprised to see a big animal listening to a small animal. He wanted to know more about the buffalo and the man. After the man went home, the tiger spoke to the buffalo. “Can You go and get it?” asked the tiger. 2. When does the farmer plow his field? 4. What is the main idea of the last paragraph? 6. What can we learn from the story? Text for questions number 7 to 10! 7. What do you think about the bear? 8. Who gave the meat to the rabbit? 10. What can we learn from the story? Untuk melihat kunci jawaban dari soal-soal di atas,an klik tombol Lihat Kunci Jawaban. Semaga artikel tentang Contoh Soal Latihan Narrative Text (Part I) bermanfaat bagi anda.